Pukerangiora Pā Historic Reserve is managed by the Department of Conservation (DOC). The Reserve has been identified as a DOC ICON site within the department’s prioritisation ratings and it has also been recognised as a Landmark site within the NZ Heritage prioritisation schedule. The status of the Reserve is such that greater funding opportunities are available for future protection and enhancement of the site. 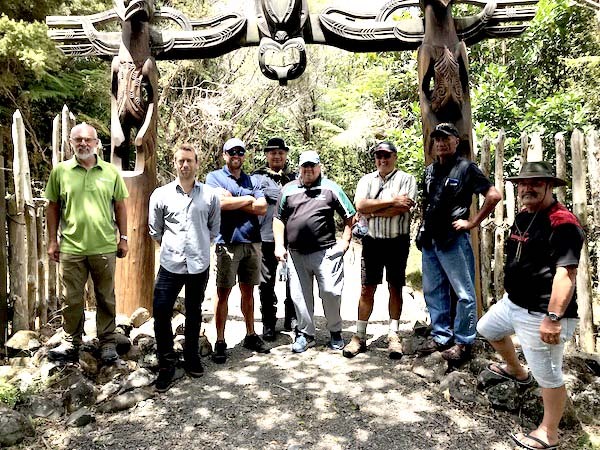 Early 2019, members of Pukerangiora Hapū were invited by the Department of Conservation, New Plymouth office, to the province of Northland to visit four sites of significance which have been strategically developed for public presentation. The visit was an opportunity to inspect the sites and build an understanding about what the future for Pukerangiora Pā Historic Reserve could be i.e. how can Pukerangiora Pā Historic Reserve be best presented to the general public by DOC in partnership with the hapū and how can Pukerangiora histories be told in a Pukerangiora way upholding the integrity of people and place. Tuesday 22nd January saw Pukerangiora hapū members, Chairperson Joseph Pullen, Anaru White, Mike Urwin and Rūmatiki Timu along with Dave Rogers and Andrew Johnson from DOC, New Plymouth office, visit Ruapekapeka Pā Historic Reserve, 45km north of Whangarei. The visiting party was met by the Chairperson of Te Ruapekapeka Trust Allan Halliday and fellow trustee Wati Cooper and DOC rangers from Northland, Shaughan Anderson and Clayton Blackwood. This was an opportunity to engage with the tangata whenua and listen to what worked well and what didn’t during the development process of Te Ruapekapeka Pā. It was also an opportunity to listen to DOC’s experience with regards to their engagement with the tangata whenua during the development process. A strategic planting plan of the site was shared, also future development and management plans. 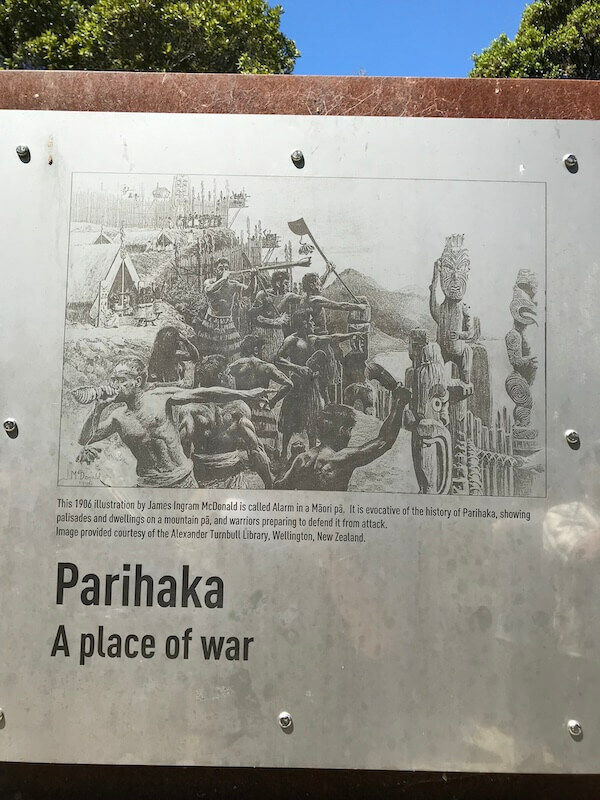 Storytelling panels have been erected at vantage viewing points on the pā site with artist impression images of what the pā used to look like, information highlighting significant dates, activities and historical narratives including biographies of prominent iwi and military leaders. 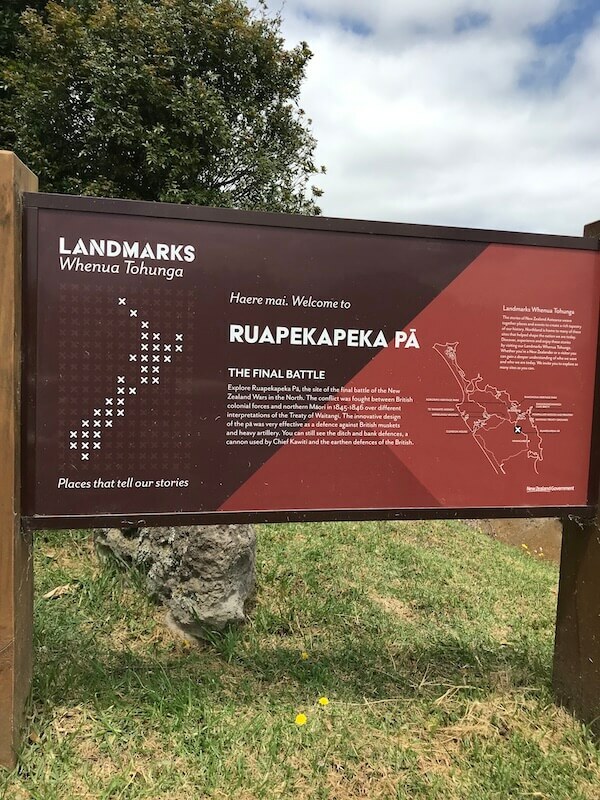 It is worth noting that QR codes (two-dimensional barcode) are featured on the panels which allows the visitor to access more information via the Te Ruapekapeka Pā website (www.ruapekapeka.co.nz). The greater learnings from the shared discussion was that open communications and stringent engagement processes be a priority and implemented by all party’s involved. This measure allows for the relationships of all party’s to grow with confidence as each stage of the project advances. Wednesday 23rd January saw the delegation visit Marsden Cross – Rangihoua Pā, Te Tii 112km north of Whangarei. The stone monument at this significant site marks the first established mission settlement and first Christian service conducted in Aotearoa. The site is approximately one kilometre long entering from a hill top location overlooking Rangihoua Pā and descending to Oihi Bay – the location of Marsden Cross. A purpose built viewing shelter stands near the entrance where a replica steel landscape model is on display showcasing significant landmarks. A S-bend walking track descends its way towards Oihi bay. Storytelling panels and sitting shelters have been thoughtfully positioned to take best advantage of the vista presented. Different structures have been positioned throughout the length of the site which include upright steel rectangle storytelling panels, large artwork pieces, memorial plaques and panorama panels with artist impression images and supporting information. Content varied in length and assorted images were used depending on what story was being told. In some cases whakatauki were used to highlight a point in the narrative. There was also a clever “window view” in one of the panels where one could clearly sight Rangihoua Pā framed by rustic panel. As a note of interest, the walking tracks went around the pā site and not on it. 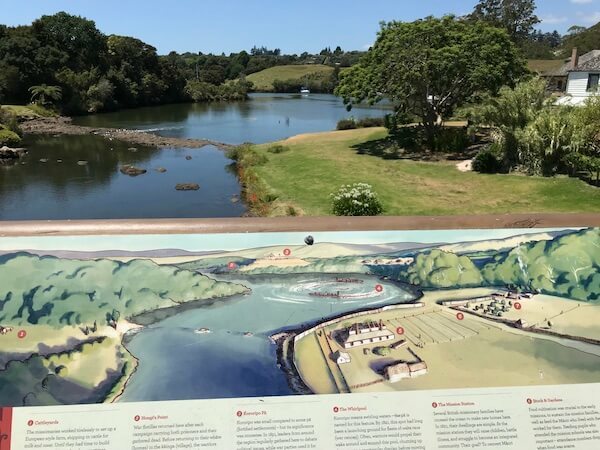 On the return trip to Whangarei the travelling delegation visited the Kororipo Historic Reserve site and surrounding area adjacent to the Kerikeri River. 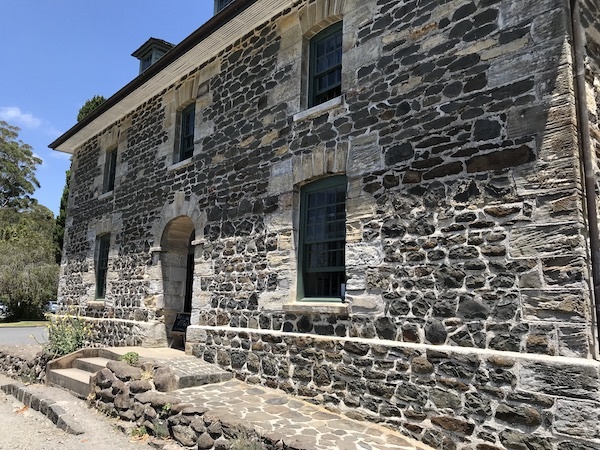 This area is well-known for the Stone Store which is New Zealand’s oldest surviving stone building built between 1832 and 1836. 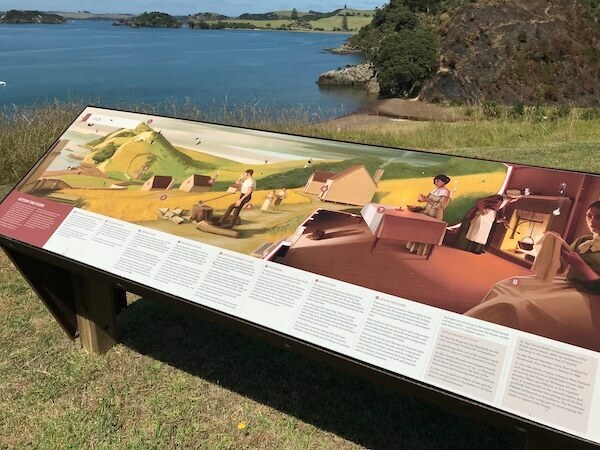 Opposite the pā site is Kerikeri Basin Reserve where a panorama panel with an artistic impression image and related information is on display identifying significant landmark features. There is also a landscape model made of copper/steel material to capture a bird’s-eye view of the area. On the edge of the pā site is a wooden palisade tower structure which has been specifically built as a viewing platform. Very much a picturesque pā site ideally promoted from the water’s edge. With time to spare before flying home, the delegation decided to visit Parihaka Scenic Reserve. The Reserve is located on an eroded volcanic cone 240 metres above sea level overlooking the township of Whangarei. The summit is home to the World War II War Memorial, identified by a towering obelisk. A number of storytelling panels presenting pre-European narratives line the short walkway to the outer viewing platform. 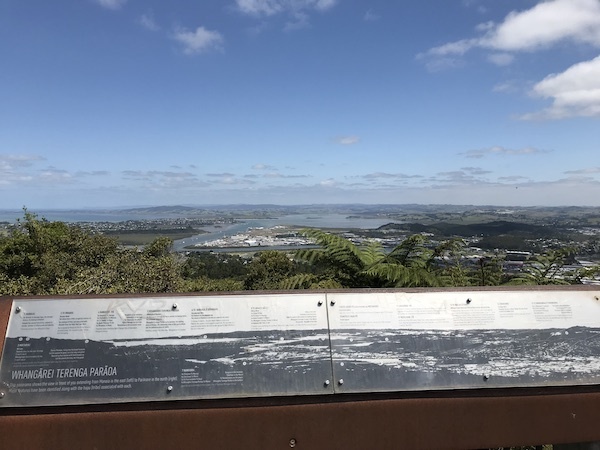 The outer railing of the viewing platform hosts a sweeping panorama panel which guides the visitor to identifying significant Māori landmarks surrounding the township. Complementary to the Māori narratives is a special carved kōhatu which represents the mouri of the mounga. Image: an illustration from 1906 by James Ingram McDonald called Alarm in a Māori pā. Visiting a number of Northland sites was an opportunity for DOC and the Pukerangiora Hapū to acquire a better understanding about how Pukerangiora Pā Historic Reserve can be managed and developed in the future. The knowledge gained from the visit will undoubtedly contribute to the future planning and development of the Reserve keeping in mind the cultural sensitivities throughout the development process. And finally, Te Atiawa would like to acknowledge Dave Rogers (Senior Ranger) and Andrew Johnson from DOC, New Plymouth office, for coordinating and facilitating the visit to Northland. On-going support from DOC has allowed the hapū to capture the essence of what is possible for the future of Pukerangiora Pā Historic Reserve, with an objective to growing public appreciation of the Reserves physical presence and historic narratives. Hēoi, mihia te haukāinga o Te Taitokerau, ā, me pēnei peangē te kōrero “inā tere ngā kāpua, he hau kei muri”. Ahakoa he whakaaturanga kei mua i te aroaro, kei muri kē te rētōtanga o te kōrero. Mihia Te Papa Atawhai nāna tēnei haerenga i whakariterite. Mihia kau nei ki te hapū o Pukerangiora, nāu te whakaaro nui kia hāpai ake i te mana o ngā mātua, te tapu o ngā kōrero me te wehi o te wāhi motuhake o Pukerangiora e!